Last year Lucindaville (and Cookbook Of The Day) offered up a Famous Food Friday about Beverley Nichols and we are doing it again. 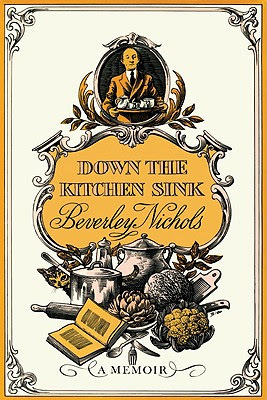 When last we were cooking with Beverely Nichols, we were pondering his "found" cookbook, In an Eighteenth Century Kitchen. This was the cookbook Nichols wrote about in A Thatched Roof. After his success with Down The Garden Path, the first and probably best known, or should I say, remembered of Nichols' books, he chose to undertake a similar culinary adventure which would become Down the Kitchen Sink. Nichols knew as little about cooking and he once did about gardening and I am sure he thought if could master gardening, why not cooking. "This is supposed to be a cookery v book, but I suspect that it will turn out to be something rather different. 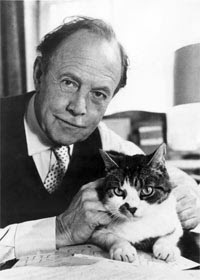 True, it contains a number of Gaskin's own recipes, which, after his death, I found interlarded among the pages of the cookery books that he had collected over the years. these were sometimes scribbled over with mysterious comments on the guest who were to partake of them, such as 'No crab for Lady F'. I cannot remember any Lady F in my life, nor why she should have been denied this delicacy." Beverely Nichols, Reginald Gaskin and Nichols gardener, Oldfield. You get the idea of Gaskin's demeanor. After forty years, when Gaskin died, Nichols found himself in his kitchen alone searching for something to eat. 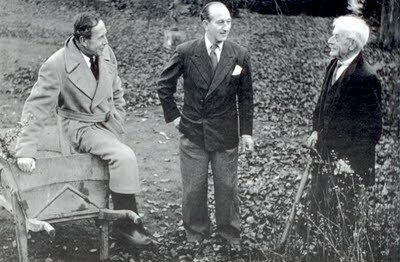 Nichols takes it upon himself to write a cookery book, but it becomes more of dining book filled with interesting people including but not limited to: Noel Coward, Oliver Messel, and William Randolph Hearst. His stories are wonderfully gossipy filled with dish and food. Clearly, some of the recipes are unique to Nichols. This unnamed recipe is on Nichols "heard" about. It is by far the strangest recipe, and one you should replicate at your own risk. I had to invent this title for this recipe does no appear in any cookery book which I have yet encountered. You take the largest capon you can buy. It must be a whooper. You then rinse 6 or 8 silver spoons or forks in hot water. Only silver will do; silver plate would be worse than useless. Now, taking a firm grip of the chicken, push the silver up its behind. As if this were not enough humiliation, follow it with two heaped tablespoonful of ground ginger. All this sounds extremely sadistic but it is no more so than keeping the poor thing cramped in a cage for the whole of its unnatural life. Having maltreated the chicken in this manner, bring a large saucepan of slightly salted water to a boil, put in the chicken, add 6 carrots and 6 medium sized onions, cram on the lid, and boil at the gallop for precisely 5 minutes. Turn off the gas, lift up the saucepan, transport to the larder, and leave to cool overnight. On the following morning you must be prepared for a shock. When you lift the chicken out and drain off the water, and remove the spoons and forks, you will find that they have all gone black. Do not be alarmed. A good soaking in any of the modern silver-cleaning preparations will restore them, though this may take rather longer than usual. A chicken prepared in this manner tastes quite different from any chicken you have ever had before, unless you are at least sixty years old, and can recall the days of your youth, when a chicken really was a chicken, and not a synthetic Robot bird, reared by Robots for the mechanical digestion of other Robots. Apart from the taste, it can be carved in delicate slices, instead of falling to pieces in the manner of the average boiled chicken of today. I cannot think of a better dinner companion than Beverely Nichols. When you try this recipe, do send us a photo -- or the chicken and the silverware! Had no idea Beverly Nichols wrote a cookery book. Thank you, I must find it. i remember the works of this guy ! he was an absolute genius!